Alstons Shipping in Trinidad & Tobago are a division of ANSA McAl Ltd which was founded in 1905, and has grown within the industry over many years. As an example of the values that the ANSA McAl group represents, ANSA have purchased a valuable medal on behalf of their employees and for the people of Trinidad & Tobago. 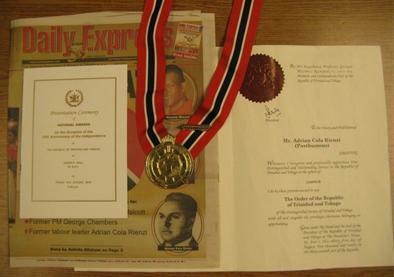 An Order of the Republic of Trinidad & Tobago (ORTT) medal was awarded to a Trinidad citizen some years ago, who departed the country to live in Canada where he subsequently died and his son sold the medal. The person who bought the medal recently put it up for sale once again on eBay. ANSA McAl made a bid of USD $25,000 and even though there were higher bids, it was sold to ANSA McAl to return to Trinidad. ANSA McAl have given the medal back to the Trinidad Government and the President has said it will be put on display in a national museum. A. Norman Sabga (ANSA McAl Group Chairman & Chief Executive) states; "We fought for this medal on behalf of all our employees because it was a chance to reiterate the values on which our group was built - Dignity, Decency, Honesty, Integrity, Gratitude and Humility. Everyone at ANSA McAl is part of our history and the citizens of Trinidad & Tobago can trust that we will continue to contribute to achieve their aspirations together. As ANSA McAl recognises our 135th anniversary, we reflect proudly upon the history and involvement in every sphere of development in Trinidad & Tobago. Our group flies the flag of Trinidad & Tobago wherever we go and we will use this occasion to grow in new and exciting ways."